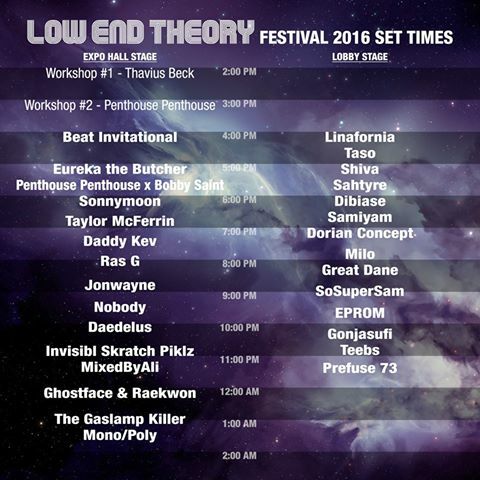 SATURDAY (7/23/16): LOW END THEORY FESTIVAL AT THE SHRINE! Our very own D-Styles & Shortkut along with the incredible Dj Q-Bert are some of the members of the Invisibl Skratch Piklz, one of the dopest DJ crews in the world. They’re finally dropping a new album called “The 13th Floor”. Their first official single just dropped, courtesy of the Red Bull Music Academy. “DJ LEGENDS! The Invisibl Skratch Pikilz have reformed after a twenty year hiatus to record a new album and perform at the Red Bull Thre3style world finals in Tokyo, Japan. Regarded as music’s most influential turntablist crews, the trio behind ISP – QBert, Shortkut and D-Styles – are respected members of the extended Thre3style family, having performed and judged at events across the world. To create the new record, the group set up shop at Red Bull Studios in Tokyo in spring this year, where they crafted the LP over the course of a week. Fans will get to see the ISPs perform the album (and probably some old favourites) when they perform at the Thre3style grand final on September at Tokyo’s Sound and Vision museum. For the first time ever, the event will be live streamed via redbullthre3style.com bringing the energy of the competition in to people’s homes. What’s up folks….it’s another installment of Throwback Thursdays. In honor of the official Invisibl Skratch Piklz reunion at A-Trak’s Fool’s Good “Day Off” Party at the Shrine Auditorium in LA this Sunday, October 12th, I thought I post up one of the best Dj battles in the history of mankind…..The Xmen vs ISP. This happened at the first ITF World Championships during the 1996 Rock Steady Crew Anniversary. Babu & myself competed in this battle, but THIS was the hightlight of the event….this was litterarlly the “Clash Of The Titans”. They broke up it into 2 parts, solos & teams. Both catagories were incredible and both crews were going all out with new techinques & routines. I remember watching this battle in person and the energy in the place was crazy!!! On the Xmen side: Roc Raida (RIP), Rob Swift, Mr. Sinista, Total Eclipse, & Diamond J. For ISP: Q-Bert, Mixmaster Mike, & Shortkut. This is the team battle…..remember folks, this is 1996……these skills are still relevent in today’s times…..always timeless, always classic! Enjoy! Our very own D-Styles & Shortkut along with the legendary Q-Bert performed as the Invisibl Skratch Piklz at Day 1 of the Redbull Thre3style World Finals in Azerbaijan. Congratulations to the 1st heat winner, Carlos Atendido of the Phillippines, who now advances to the final round this week.